☑ Popunder: PopAds ☑ Banner: Infolinks ☑ PPD: Up4ever ☑ URL Shortening: Adf.ly ☑ Adult: JuicyAds ☑ Cheap Quality Traffic: Popcash ☑ Like This Site? Don’t forget to share it! For the major part of the on-going decade, AdSense has ruled the global market when it comes to providing advertisements for websites and CPM and CPA and other such mechanisms which help generate website revenue. 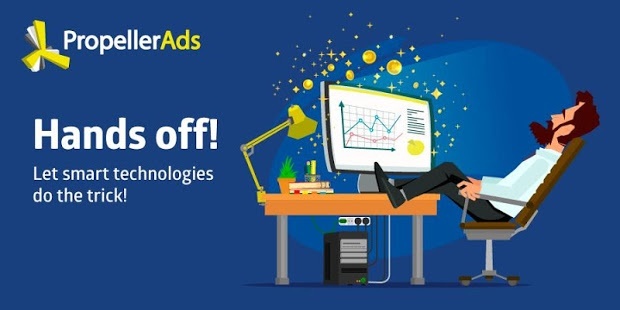 Over the recent few years numerous AdSense Alternatives have turned up which have given the option to people all across the globe to gain the advantages of a more competitive ad market in terms of higher CPC rates, increased networks and better revenue potential. Many have had their own success stories. I was looking for such alternate networks when I came across Propeller Ads. The network was founded in 2011 with the basic idea for providing clickable ads for website audience and in turn generating revenues from them. They have come a long way in their ordeal and are currently providing more than 650 million daily ad impressions for desktop and mobile visitors. That is a wonderful achievement. They have a plethora of formats when it comes to ads. Direct links, banners, sliding banners, pop-under ads and many more formats can be availed here. In fact they are the leading pop-under network globally. After thoroughly analysing what it had to offer, I came to a conclusion that this was an ad network which to cater to a more diverse group of clients and help them generate increased revenues from their pages. Technically speaking I found Propeller Ads to be a worthy alternative to AdSense. People who are already sworn to other networks can add it for some extra passive income and so can those people who have been rejected by AdSense for any legally authentic reasons possible like content terms and payment terms etc. People who have only worked with Cost per Action or CPA networks before can also take benefits of this ad network and expand their monetization strategy. This is a big plus for me as the network keeps its promise to make the benefits of online marketing available to anyone. Many ad networks have many constraints and restrictions when it comes to placing and formatting ads. Such is not the case with Propeller Ads. As discussed above there are multiple formats from which the publishers can choose for both desktop and mobile. The CPM rates are high and the fill rate for international traffic is a 100%! Their system also has built in algorithms which tests numerous CPA/PPI/PPC affiliate programmesand finds the one which is most useful for your website. That means a lot of time and energy is saved! Another huge plus with this network is that there is no threshold traffic. This means that even if your website is new and not gaining the traffic to the desired level you can still apply for ads here. This is not the case with AdSense or other ad networks. The registration is quick, easy and hassle free. To top it up, the referral program offers 5% of corresponding referral revenues to publishers for life. Attractive isn’t it? 3) It is advertiser friendly too! The network has a huge international reach of websites which provides quick reach to your target audience, no matter where they are. Plus it targets web and mobile traffic alike to boost your sales and engagement. The entire spectrum of target opportunities is huge and simplified here instead of being small and complex. All programmes ranging from CPM or CPA or CPL or PPI are performance based. On top of that each advertiser gets a personal account manager which makes communication more open, transparent and productive. They also use BRANDSAFE defence technology to protect the name of your brand. The target traffic is also superior as it involves targeting by geographic location, day parting, by frequency capping and by Operating System recognition. This feature is quite interesting. Here user initiated full page advertisements that may be implemented anywhere on the page are provided. So, there is no use of high click ads through creative. The user or visitor is automatically directed to the offer. They provide in-banner video ads in the form of pre-rolls, mid-rolls, post-rolls and pre-game. These are only 10 to 30 seconds of video advertisements which run at the start of video content or flash games. This host of features do make it a very strong and attractive choice for both publishers and advertisers. It provides publishers to earn increased passive income from their websites and posts ads which are relevant to the content of these websites. It assures you of the highest CPM rates possible and also has easy payment and withdrawal options. You can choose from the various payment options, whichever goes in sync with your resources. The time lag between two payments is large as in 30 days. This can be tedious some times. Although it has a lot of payment options, it still does not have PayPal which is the most common of all. This is a big demerit as it leaves many of the publishers and advertisers stalled. CPM rates for banners are not as excellent as for pop-under but this can be equalised by increased traffic. There may not be a traffic threshold but still the ad network is not suitable for an extremely new site which has like 1000 views daily then the revenue generated will be virtually cents per day which is not beneficial. Thus, it is advisable to opt for it at a later stage. If you still wish to opt due to the other benefits then pop-under and mobile ad units will provide you with a better revenue potential. My final opinion of the website is positive. They are working on the PayPal addition and after that is done I guess this site has to be an attractive choice for both publishers and advertisers.